We are committed to help improve the health of the nation. We do this by making it easier for customers to make healthier choices with clear front of pack nutrition labelling and reformulating our products to make them healthier, whilst maintaining the great taste. As part of this commitment, our development teams and suppliers have been working hard to successfully reduce salt in our products for many years. Salt reduction continues to be a key part of our product development process with 87% products now meeting the 2017 salt targets. Co-op Food seeks to be open and honest in our approach to labelling and provides information in a way that allows customers to make informed purchasing decisions about our products. We operate a customer focused honest labelling policy and have done so for many years. In fact, 30 years ago, we were the FIRST UK retailer to implement an on-pack nutrition labelling system. 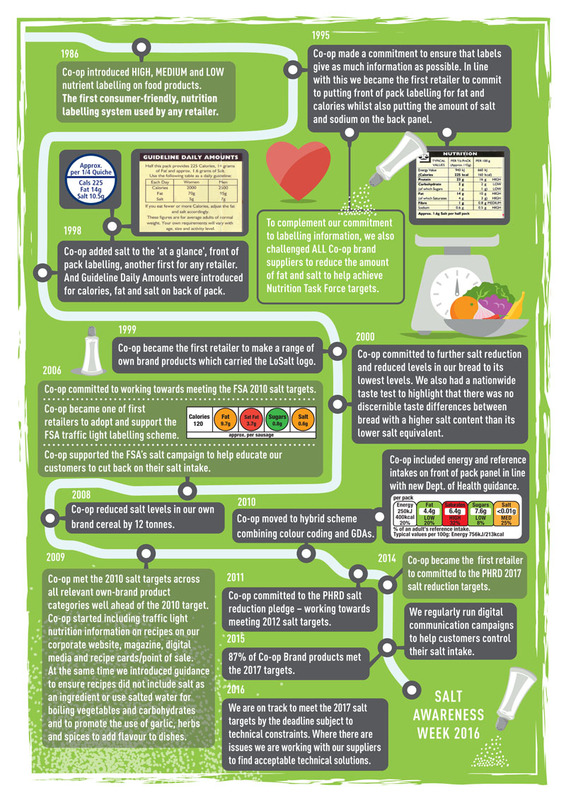 Here are just a few of the milestones from the past 30 years, right up to the current day which highlights Co-op Food’s commitment to providing products and information to help our customers make healthier choices. And on the website we have tips on how you can take steps to reduce the amount of salt in your diet.